This stela provides an excellent illustration of the development of Egyptian art during periods of weak central kingship, when local workshops produced formal monuments with hieroglyphic inscriptions without the controls of rigorous royal or temple sculptural training. 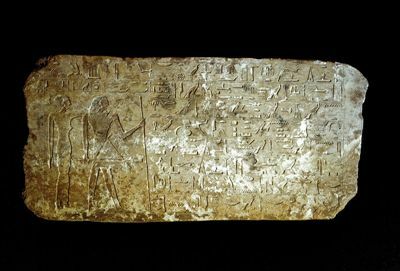 The figures of Hetepneb, a local administrator, and his wife, and the cutting of the hieroglyphs are in the provincial style typical of the area north of Thebes during the 1st Intermediate Period. In the left margin outside the framing rectangle may be seen a small incised figure of a man, possibly a 'signature' of the sculptor or an addition by a later hand. (1) An offering which the king gives, an offering of Anubis foremost of the divine booth, he who is upon his mountain, he who is in the Embalming Place, lord of the sacred land, so that the king's sealbearer, (2) sole companion, lector-priest, overseer of tenants of the Palace Hetepneb may be buried in his tomb (3) which is in the necropolis in the western desert, having reached a very good old age, on (4) the fair roads of the western desert, upon which the revered ones tread (5) when he has traversed the land and sailed the firmament, may the West (6) extend her arms to him in peace, in peace before the great god. An offering given of the king (to) Osiris (7) lord of Busiris (for) voice-offerings for the king's sealbearer, sole companion, lector-priest (8) the revered one before the lord of Upper Egypt, lord of Qus, whose good name is Hetepneb (9) his wife, his beloved, she who is known to the king, priestess of Hathor, Iri.